The Wales Coast Path was developed by the Welsh Government in partnership with Natural Resource Wales, sixteen local authorities and two National Parks. It’s an important initiative that aims to encourage both locals and visitors to discover and enjoy Wales’ outdoor spaces. 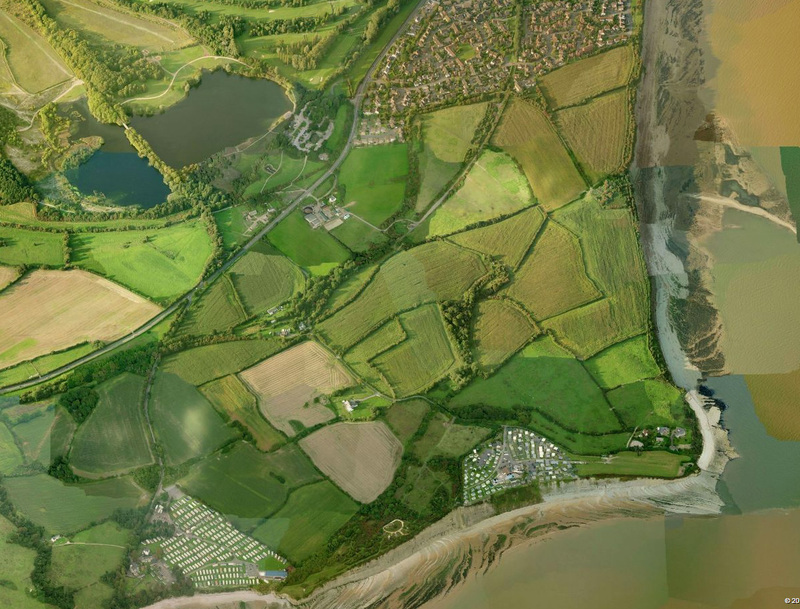 As links to the villages and towns along the Path improve, it is expected to generate a number of circular coastal routes that will enable the exploration of Welsh seaside communities. An excellent web site and app support the discovery of the Path. This ‘eighth wonder of Wales’ is now well established as one of Europe’s great long-distance paths. How many realise that its route takes in urban areas as well as beaches, cliffs and countryside. The Path is faced by hundred of properties, yet how many residents know that they are living on its route. These buildings and houses offer a rich and fascinating insight into the way Wales has changed over the centuries. The sea, coastal geology and landform have been important in shaping the urban areas that lie near the Path. The Path meanders as it crosses highways, and passes through ports, seaside resorts, industrial areas. Some areas are dominated by roads and services, others are awkward or forgotten backwaters, but all offer a rich display of urban history and character, man’s relationship with the sea, and occasionally some impressive architectural features. 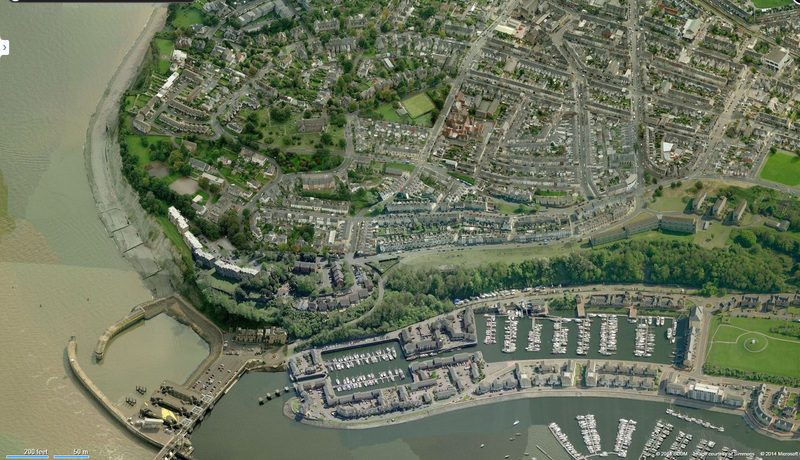 It looks at the urban fringe between Sully and Penarth and comprises a brief written account of the route shown on Map 103 of Region H. Images of this section of the path and its buildings can be found in the gallery links below. The best way to reach the sea is by way of the public footpath which skirts the HMS Cambria base at Hayes Lane. Its high wire security fence may seem unpromising, but the gateway to the sea and a view of the Bendrick Rock soon appears. The Bendricks, just east of the entrance to Barry Docks, is a wild and dramatic rock platform against which the sea crashes. Westwards Barry Island dominates; turn eastwards and you start a varied walk that illustrates how nearness to the sea has influenced land-use and building. 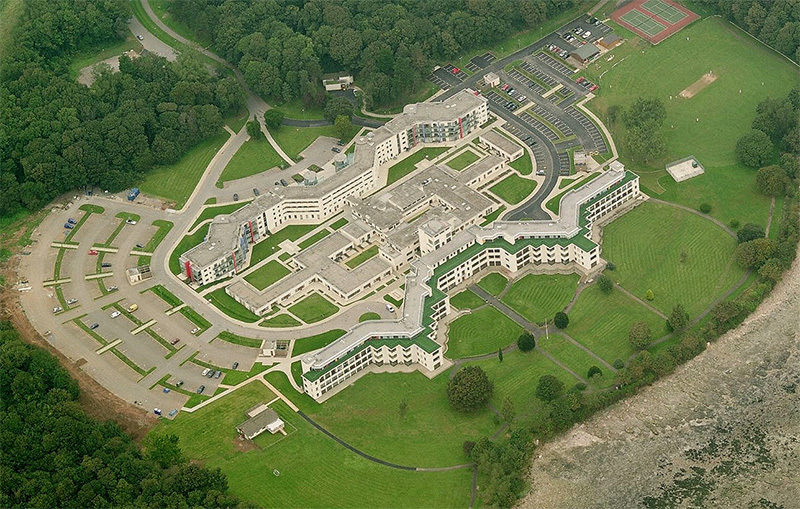 Sully Hospital was built for tubercular patients, on a site and to a design that made the most of light and air. It was designed by W. A. Pite and Son and Fairweather in 1931 and was opened in 1936. Though now converted to flats, its dazzling white rendered walls and full height windows still dominate the former V-shaped wards facing the sea. This is one of Wales’ best modernist buildings. Neighbouring Tŷ Hafan’s Children’s Hospice, designed by Nigel Arnold Architects and completed in 1999, adopted the same white modernist theme. Its low buildings and curved lines create a friendly haven for children and visitors. 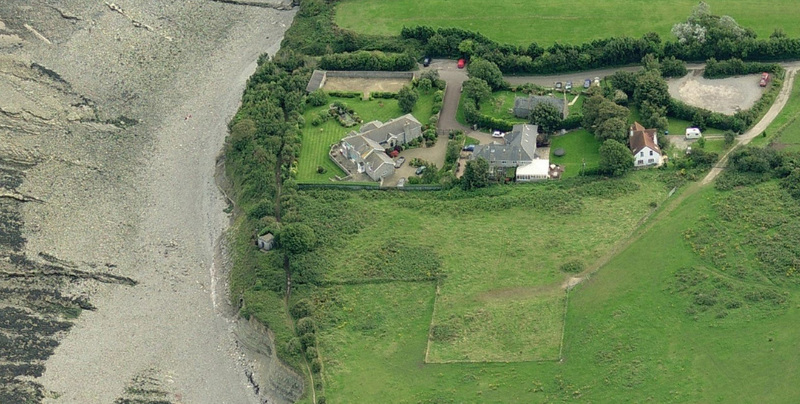 Before long the path skirts the bungalows, gardens, and hedges which mark out Sully’s low-rise brush with the sea. It is surprising that building heights have in the main been low and modest, with few adapting or raising roof heights to meet contemporary demands for extra space There are a few quirky roof forms and more recently a few plots have been developed as two-storey houses, notably a pair in Smithies Avenue, designed by Chris Loyn and Co Architects (2010). Next, the path skirts sites for caravans and mobile homes: low and dull but well hidden by hedges and rough cliff-top scrubland. A short open interlude at Swanbridge and the Captain’s Wife signals some 19th-century vernacular building before more caravans and a then the sweeping views gained from Lavernock Point and its Second World War defences. These have been scheduled by Cadw and are-well placed with the Wildlife Trust’s Nature Reserve which lies behind. 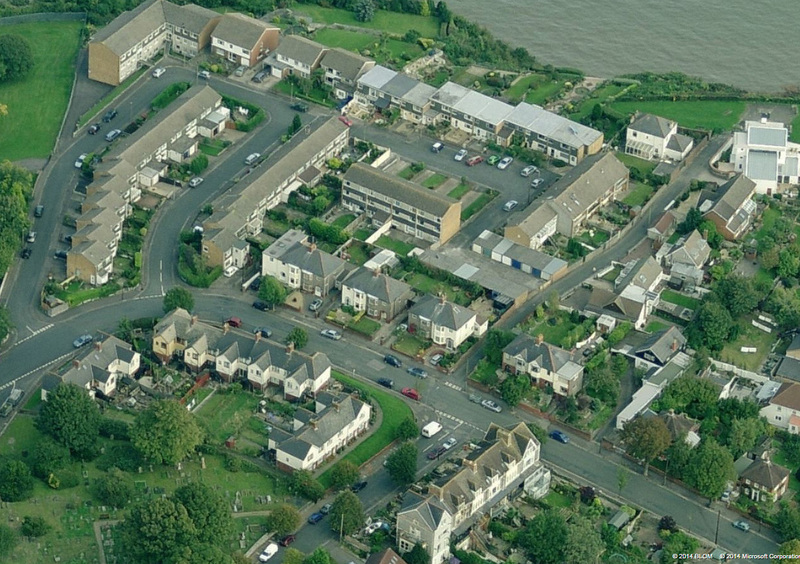 The hamlet of Lavernock with its little St Lawrence Church is the next settlement. Here the cliffs turn north and and there is one last lap before the path heads into the Penarth Cliff top area. Here houses have been designed to make the most of the sea views; there are balconies, dormers, and look out points everywhere. Gardens are getting smaller as plots become dominated by ambitious house remodelling and extensions. The eastern end of Penarth Cliffs boasts two impressive modernist buildings: the listed Sea Roads at 5 Cliff Parade (designed by Gordon Griffiths in 1939), and at Forrest Road a similar modernist approach can be glimpsed above its enclosing walls on the corner of Forrest Road. The path descends to Penarth beach. Here the seafront and Esplanade remain in a constant state of change. 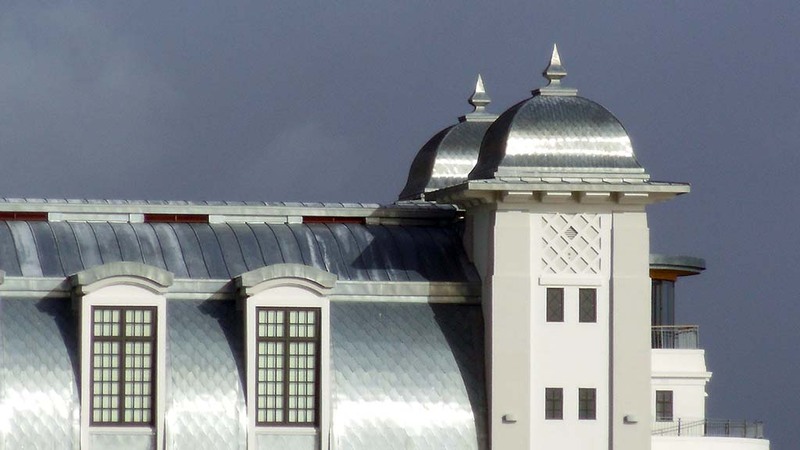 The happiest recent event has been the re-opening of the restored Penarth Pier Pavilion, its roof is now clad in zinc, This is now a shining beacon to community endeavour. The path then climbs again to wind its way up and over Penarth Head. Here building is varied, a mixture of periods, scale and height. But the predominant stone is the local blue lias limestone. Brick and timber are used as decoration on terraces and villas alike. On Clive Place there is an attractive row of 1930s semi-detached houses known as Jenkinsville. These have a simple Arts and Crafts theme. 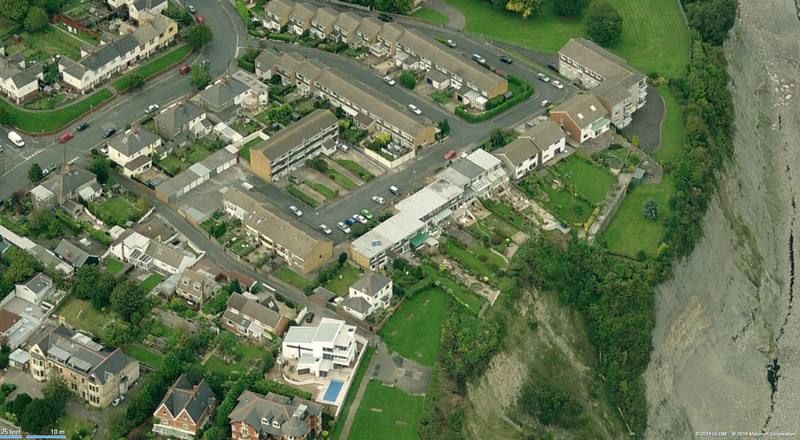 They form a group with the pretty council homes perched on the embankment opposite. 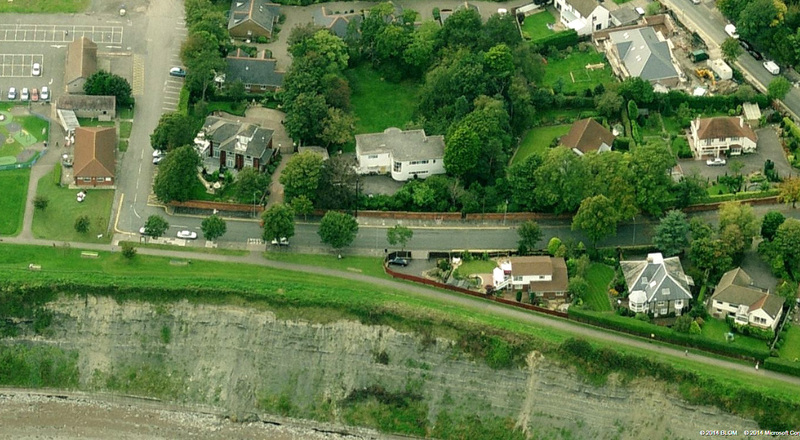 The more recent housing in Uppercliff Close is built on the site of the former Uppercliff House and enjoys the views offered by the headland, but what an odd way to design a connection with cliff and coast! The path now descends towards the Cardiff Bay Barrage and the former Penarth Dock, developed in the 1980s as a marina. 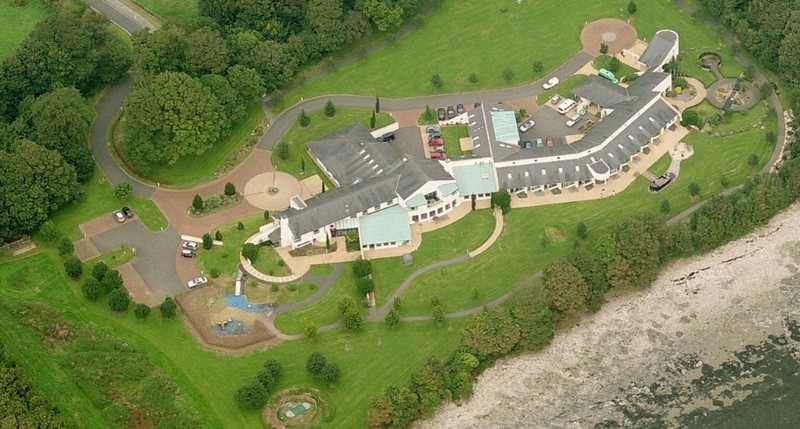 The route passes the solid Headlands School, formerly a hotel with stabling; and a 1960s development known as Northcliffe, as a final nod to the former mansion of Northcliffe Lodge which stood at the cliff top. Look out for the Victorian drainage vent which survives as an early piece of street furniture. This part of the walk runs through the mass of terraces and mariners’ houses built to support the development of the Dock and its massive coal trade in the 1870s. The port closed in 1963. The next section starts at the Barrage, and will be the subject of our next blog. Is there an area close to you which walkers should know about? The walk presents countless opportunities to explore and discover urban backwaters This account has used the Civic Trust’s Exploring your town characterisation toolkit to identify some of the features that makes this route special. Why not make your own discoveries? The ‘County Treasures’ volume for Penarth is a great source of extra information on buildings along this section of the path, and throughout the Vale. 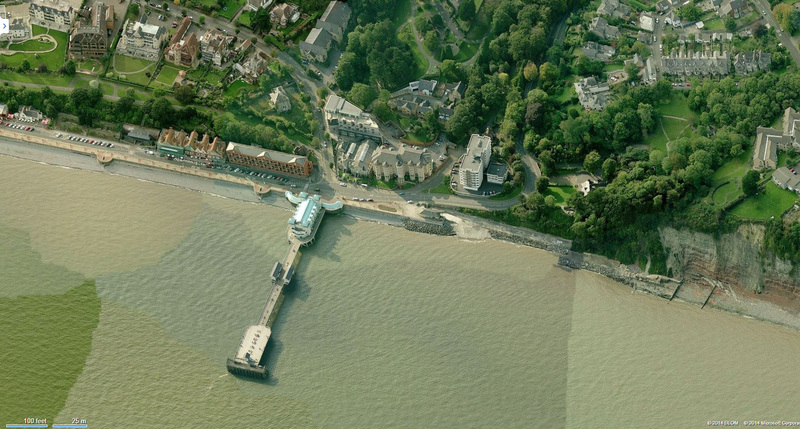 It was completed in 2007 by a partnership comprising CTW, The Penarth Society, and the Vale with Cadw and HLF funding.